Susan and Joshua meet me in the Square for the Tuesday lunchtime walk – we wait ’til 1.15 but they are the only ones today. We decide to walk down past the castle to the river, on part of the route that I scoped yesterday. As we walk we talk about Huntly – Susan has lived in Rothiemay for 6 years, and grew up not far away in Banff, but until she had Joshua (or during her pregnancy with him) she’d not really had reason to come to Huntly. But it’s the hub for antenatal care, and for baby activities going on in the area too, so she’s starting to get to know it a little bit now. We talk about babies shaking up your life – about work and maternity leave – and sociability and structure. We talk about how hard it can be to find out what’s going on – and how hard it can be to get ready and out on time to make it to things that only are on for 45 minutes or an hour. We talk about sleep, and lack of it, crying, waking in the night, noisy sleeping and not being able to get back to sleep. The babies sleep while we walk. We talk about the weather and sunburn and suncream and insects. We talk about teenagers (we are looping back past the school) and mobile phones and social media. We talk about living in the city, and being able to just walk out for anything you want or need at anytime of day, and living in the country. Susan and Joshua have been walking along the road near where they live today, quiet roads, but fast cars on them. 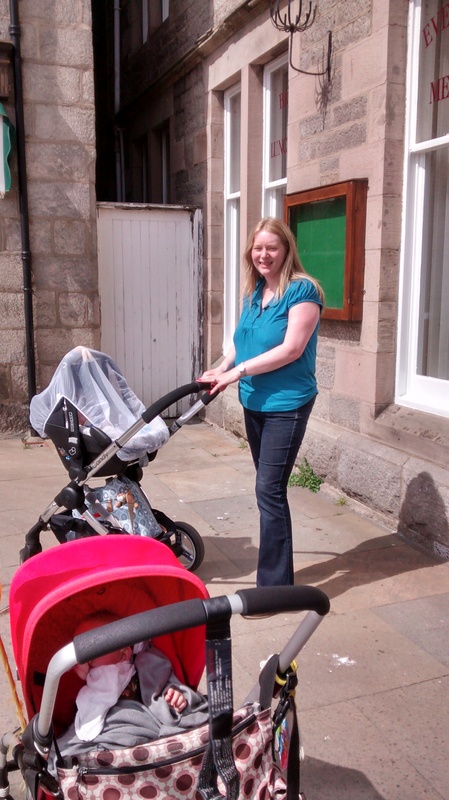 We head back to the Square – Joshua has his 8 week jabs at 2pm, both babies have slept almost the whole way.